Yamhill County, Oregon Horse Directory - O Horse! Professional personal trainer for both horses and their human partners, creating a lifelong trust and working relationship. Andrea focuses on teaching balance and movement to young horses and the fundamentals for both English and western riders to become confident and successful. Colt starting to finishing and everything in between. Training programs customized for you and your horse, whether it's starting colts the right way, extensive trail riding experience, or overcoming a trust issue. No stress training along with correct conditioning and movement correction. Your horse will see riding as a challenging, fun activity where he has a partner who he trusts. Colt starting is done at each horse's schedule. I will not start riding until the respect and understanding requirements are in place. Some horses take one afternoon; others take weeks. 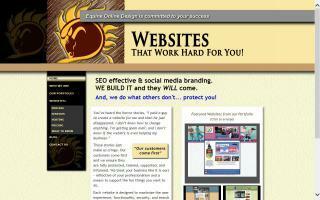 Equine Online Design is a small web development and graphic art business dedicated to producing high-quality website designs and graphic art for logos and web. Our websites, logo/art designs, and hosting services are tailored to the small business owner who wants a professional presence on the Internet without the high prices of big business designers or the headache of trying to figure it out for themselves. We work with our clients to assess their particular business needs in order to create an original website or graphic design that will capture the essence of their business. Our goal is your satisfaction with a look and functionality that is original, is generated from your ideas, and expresses your business goals. A non profit horse rescue and horse blanket wash and repair service provider. Quality, affordable horse blanket wash and repair services with free pick up and delivery; one week turnaround and excellent service. 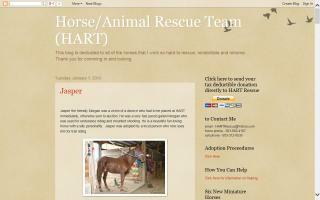 HART Rescue is a non profit horse and animal rescue team located in Yamhill County. We work with the local law enforcement agencies caring for abused, abandoned, or lost horses and livestock. HART buys and sells horse tack to raise funds for the rescue. We also accept donations of unwanted horse tack, feed, supplies, or money. If you have any tack that you would like to sell or donate, please talk to me about it. I also have a small hay bank to help people who are unable to buy feed for their animals, so if you have any surplus hay you would like to donated, please contact me, and I will pick it up. I occasionally send out information emails with updates on what is going on at the rescue, adopted horses, horses that are up for adoption, etc. If you would like to be added to that list, please email me through this ad and I will put you on the list. If you have any questions or would like to come and see my rescue for yourself, please contact me. Visitors are always welcome! company picnics, church socials, school fundraisers, special occasion, children and adult camps, team building, hand led pony ridesm and picturesm too! Making children's dreams come true by bringing ponies to you. Oregon Dream Ponies fulfills a lifelong dream for Bob & Kim Taylor. Growing up in an urban lifestyle, Kim rode every pony ride in Oregon. Kim dreamed of having a horse of her very own. One time, Kim even tried to convince her mom that there was room for a pony to live in the garage. Kim's mom did not go for that one. Bob's dream of owning property and running a family business came together in 2010. In June of 2010, Bob & Kim were fortunate enough to be able to purchase 5 beautiful acres in Newberg, Oregon. They now enjoy 6 horses/ponies, a bunch of chickens, 1 goat, 2 ducks, 5 dogs, 1 cat, and 1,100 Christmas trees at the Taylor's Hillside Farm. Being able to share horses with others that are not growing up in an atmosphere where horse ownership is possible is a dream come true for Bob & Kim Taylor! 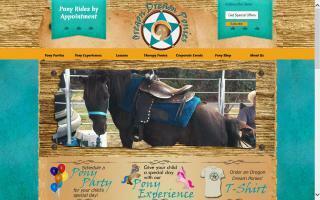 Oxer Ridge Farm is a hunter/jumper training facility located in Newberg, OR. There are 22 total indoor stalls, 9 large grassy pastures with daily turnout, a 80x180 indoor arena, and a 250x350 outdoor arena. There are individual training programs. The trainer is Rene Donley. Contact information for Rene Donley is (503) 747-9626. The USPCA is a non-profit organization providing safe shelter and veterinary and behavior care for seized, abused, neglected, and abandoned animals; progressing from rehabilitation of these animals to permanent rehoming services. We partner with law enforcement agencies, the Unwanted Horse Coalition, foster homes, and other humane agencies to give a voice to animals that would otherwise have none. Our goal is to reduce cruel and inhumane treatment to animals, provide them a second chance at life, and rehome these animals within the bounds of law. Katie's Coast to Coast offers both fancy and working tack, fancy dog collars, cowgirl clothing, western home decor, pet and animal health supplies, and cowgirl jewelry. We are dealers for Cowperson Tack, Double J Saddlery, Weaver Leather, Best Ever Pads, Rockmount Ranch Wear, Ransom Ranch Clothing, Reinsman, Cashel, Toklat, Luan's Leathers, Weatherbeeta, Big D, and many more! Let us outfit your ranch house with cowboy and cowgirl bedding, dishes, wall decor, and art. Sign up for our monthly specials and receive advance notice of new products and special discounts. Our mission is to promote humane standards and education, prevent and investigate cruelty to animals, to provide shelter for animals, and to aid in the enforcement of all laws relative to animals. We have assisted the Marion County Sheriff's Department in two seizures of 11 horses this year (2010/2011). We are a non-profit organization that functions solely on donations. Your donation means we can continue our good work in rescuing animals in need.